Each pair of our eyeglasses are tailor-made to the patient’s specific visual needs, prescription, and frame. Our prescription lenses are made by Essilor Laboratories, the world’s leading provider of eyeglass lenses. Essilor is dedicated to research and innovation and is the proud manufacturer of Varilux progressive lenses and Crizal anti-glare lenses. 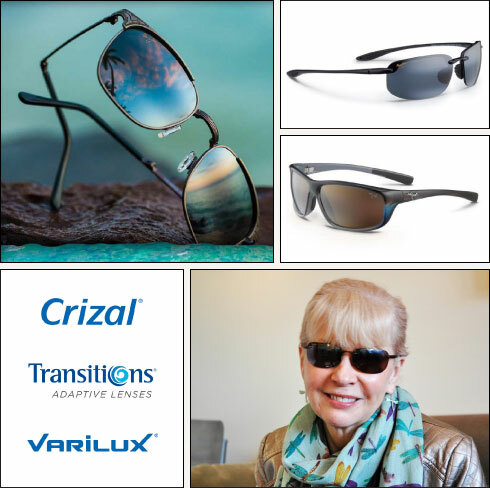 For patients over 40, the Varilux Comfort W2+ progressive has the most premium lens design available providing the sharpest vision at every distance with wider visual zones and less peripheral distortion. It utilizes a customized digital lens design which is adjusted for each patient’s specific needs creating optimal visual clarity and sharpness. Crizal Avancé UV™ lenses insure perfectly clear vision by eliminating glare, especially at night or when working on a computer. They reduce smudges, provide maximum UV protection and have a one year warranty for scratching. All of our children’s glasses are fabricated with Litestyle brand polycarbonate lenses which combine impact resistance with UV protection. It produces a durable and safe lens perfect for active lives of kids. All of our children’s lenses are priced at an unbeatable value of $118/pair. We also offer Transitions photochromic lenses. These dynamic lenses are designed to be worn both indoors and outdoors. They automatically adapt to different lighting, by becoming lighter and darker, to give the patient a more comfortable viewing experience while providing eye protection from damaging UV light. Our Maui Jim prescription and non-prescription sunglass lenses have PolarizedPlus®2 technology which reduces glare and harmful UV while boosting the colors the eyes see naturally. Colors appear more vibrant, with exceptional contrast and clarity. The lenses have a waterproof coating, anti-reflective treatment, Clearshell anti-scratch technology, and a one-year warranty.